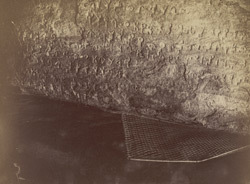 Photograph of the second half of the Asoka Edict at Sasaram, taken by Alexander Caddy in 1895. Ashoka (reigned ca. 272-231 BC) was the most illustrious king of the Maurya dynasty. After his conquest of Kalinga in Orissa, struck with remorse at the suffering he caused, he converted to Buddhism and spent the rest of his life propagating his dharma (law). In order to achieve this, he had numerous edicts inscribed on rocks, pillars and caves, throughout his vast empire. These are written in various vernaculars and represent the earliest written document from the Indic regions. From these edicts it appears that Ashoka was an extremely tolerant and benevolent monarch. In the 'List of Ancient Monuments...of Bihar and Orissa' of 1931, M.M.H. Kuraishi wrote, "The Asoka inscription at Sassaram contains one of the earliest edicts of that Emperor (Minor Rock Edict I). It is engraved on a small boulder and consists of 8 lines in archaic Brahmi characters...A portion of the inscription is damaged."